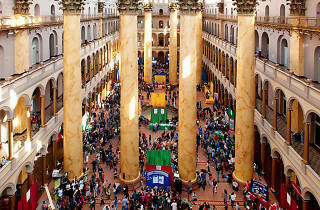 A privately run collection, the National Building Museum produces smart, noteworthy exhibits focusing on architects and the built environment, both contemporary and historical. 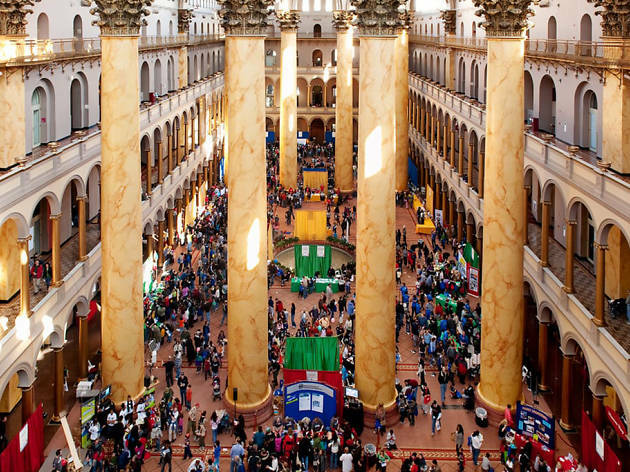 However, the main attraction is without doubt the building’s Italian Renaissance-style Great Hall, with its central fountain and eight colossal 75ft Corinthian columns: visitors crane their necks for a vertiginous look at the ceiling 15 stories above. Among the exhibitions, House & Home discovers the history and many meanings of "home", both physical and cultural, with an array of all things household, from household goods and decorations (including a poster of Farrah Fawcett and a fondue set), to building materials to mortgage papers. The red-brick building, designed as the US Pension Building, was completed in 1887. Note that the Building Zone, a hands-on introduction for visitors aged two to six, closes at 4pm.